After a brief hiatus for real life, let’s get back to business with some other real life: non-fiction! 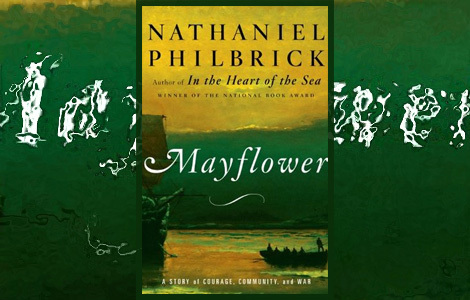 Mayflower, by Nathaniel Philbrick, is, as you may have guessed, an account of the settlers who crossed the Atlantic on a ship called the Mayflower. Often referred to as Pilgrims, these immigrants were not the first to try and settle in North America, but they were one of the first to make it work. Their story has stuck in our consciousness ever since. Nathaniel Philbrick, however, is not as interested in the establishment of the settlement near Plymouth as he is in the Pilgrim’s relationship with the Native Americans. He looks at how the relative success of the new settlement shaped the future of the region, culminating in King Phillip’s War, which saw the beginning of the end of a significant native presence in New England. Don’t be concerned by my synopsis. The author gives plenty of background on the people who sailed on the Mayflower, why they wanted to go and the difficulties they encountered on the journey. He begins prior to the voyage, which effectively sets the stage for decision-making to come as the travelers try to take root in the new world. None of this important history is overlooked. Rather, it’s viewed through a forward-looking lens, illustrating the ripple effects of the first encounters with the Indians and how it led to war fifty years later. The narrative of Mayflower is often gripping. Somehow Mr. Philbrick manages to juggle relating historical facts (and the occasional conjecture), re-constructing long-gone people, and developing a cohesive, exciting story, all without dropping anything. He doesn’t over-indulge in minutia; he doesn’t get carried away with action. He strikes a perfect balance that results in fascinating storytelling. Both Native American and European culture in the new world are explored, how the differences led to clashes at times and sometimes even harmony (not as often as the clashes). On that note, I thought Mayflower, as a look at Native American and colonial interaction, was an interesting companion to Astoria. Where Mayflower details the east coast and the forced community between the two parties, Astoria looks at the start of western expansion and the first inroads into the Frontier. Sure, there are more in-depth explorations of both subjects out there, but these two books offer a good starting point, and a somewhat lighter read if you’re lazy like me. If all of this isn’t grabbing you yet, I think when you get to the events of King Phillips War, you’ll be surprised. I didn’t know anything about this part of North America’s history. I flew through those pages faster than a pulp action novel. Yet it’s really a story of flawed human beings. The battles and the look at fighting during those times is interesting, but it’s the choices of the people involved, how their weaknesses and character flaws created a conflict that didn’t have to be, that make it both tragic and page-turning. The human experience is what writing is all about, and I think Mayflower gets it. I’m not a Native American. Far from it. What I find interesting about Mayflower and other books I have read, is that the various Indian people, while naturally suspicious, if not outright frightened, of the Europeans, tended to have more of a live and let live outlook on life, more so than we even have today in the United States (I’m generalizing, but the feeling is still there). They were often interested in making contact and seeing what the other party was all about. Trading was part of their life and they were willing to let the strangers be part of it. Europeans, on the other hand, were okay with it until they found all the ways they could take advantage of the natives, which they were quick to do. Capitalism at its best. You may want to say to the victor go the spoils. That’s fine. I don’t believe in trying to change hundreds of years of history just to feel better about myself. But there’s nothing wrong with lamenting the loss of a culture that existed for so long on what was once such beautiful soil.